The summer has just begun, and already I'm trying to keep myself from locking myself in the bedroom with a gallon of Ben & Jerry's Chocolate Heath Bar Crunch and a stack of US magazines. My kids are driving me batty. 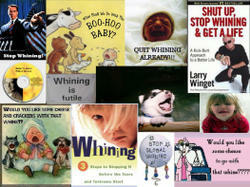 I have one who never stops complaining. I have one who never removes his nose from a book so I constantly have to keep one hand on his shoulder as we walk around, lest he find himself plummeting down an uncovered manhole or wandering off into three lanes of oncoming traffic. I have one who thinks it's her job to remind me what my name is. As in, "Mama, what are you doing, Mama? Mama, can I have some apple juicy, Mama? Mama, where are you going, Mama? Mama? Mama?" If I don't answer, she'll keep up this string of commentary until I do answer. And if I answer? She still keeps it up. Good thing I don't have four children. My trip to Chicago mid-month cannot come fast enough. I love my children, I really do. But right now I would like to love them from a distance. The man of the house has ordered me to contain my woolies. As a result (and seeing as there is a 40 percent off sale at my LYS this weekend) I am parting with some lovely items. The deals and steals are viewable at Flickr. Terms: PayPal preferred, first come, first served. 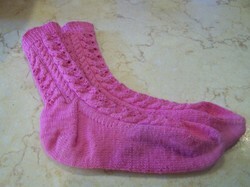 The Baudelaire socks from Knitty, done in Lorna's Laces Shepherd Sock, pale pink, on size 1 circs. New skills: The sewn bind-off, reading a chart, and cables! Woohoo! Pretty, eh? I liked the pattern a lot and found that while I could not knit without the pattern, I soon became easily able to recognize where I was in the pattern. That made life much easier! They fit well, and I have a ton of LL left over. Bummer -- I changed balls in the middle of the heel of the second sock, and the yarn is DEFINITELY a different shade, though they were from the same dye lot. Don't you just hate that??? I am hoping that after washing, it will be less apparent. That Cookie is quite a little crafty lady, isn't she??? Now that I've done these, perhaps I will be tough enough to undertake the Pomatomus. Love those. And I can't forget Monkey. I mean, if you are going to knit socks, shouldn't you KNIT SOCKS???? 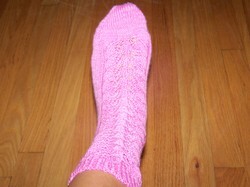 I just cast on for a pair of Diagonal Rib Socks from Knitter's Daily by Ann Budd. I am doing them toe-up instead of cuff-down, and I'm not sure how to convert the pattern, so we shall see what we shall see! 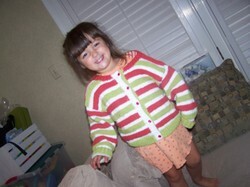 Next up, we have a little cardy for Callie. It's done in garter stripes alternated with stockinette. Very easy. Cheap, too. I got the pattern (and the yarn) from Lion. I'm not a big craft-store yarn buyer, but this was so cheap that i couldn't say no. I think it took three skeins of their Cotton-ease, and they were like $3.50 each. A sweater for $10?? Sign me up. I purposely made it a bit big so it will last longer. We'll see if she outgrows it or grows to hate it first. What's next? More socks as reported above, plus I am tempted to join in the Elizabeth Zimmerman year-long Knitter's Almanac knit-along that Kelly at KnitPicks is starting. Anyone interested? I've been on a Project Spaciousness kick for a long time, now, and I'm finally discovering that it doesn't just pertain to my possessions... I'm trying to make space in my life, too. I also believe that God has a way of making room for His plans whether or not we're on board. Right now, I feel him clearing my social calendar. I feel like I've lost many friends over the past 12 months. Most have not been by choice -- instead just situations where the other person had chosen to leave the relationship. Man, that is painful. I lost my first best friend in a long, long time -- she has chosen a different path and it does not include me. I still ache over that. She's my baby's godmother, and there is a space for her in my heart that has not healed over yet. I lost my book group. Most of the women weren't really close friends -- more like friendly acquaintances -- but I really enjoyed them and will miss their presence. I lost my favorite scrapbook store, and with it the frequent hanging-out sessions with one of my favorite people, Terri. She has five kids, so even though she's not running the store any more, she doesn't really have "free time" to get together. (We did finally manage to get together for a Starbucks visit -- our first in 6 months! -- the other day. I hope we'll have more of those!). And so on... It's quite lonely. But I have faith that God will fill the holes. I am excited to see who will come into my life... but I find it difficult to "make new friends." I feel too old for this! It brings up all my insecurities and fears and "am I good enough???" feelings. Tell me about your friends. Are they friends of convenience or friends of the heart? Where did you find them? Have you ever lost a friend? What happened and how did you recover? My kids are lying here watching "Open Season." My favorite line is when the Debra Messing character says, "That guy really chaps my khakis." Believe me, Debbie, I know the feeling! *Weather that doesn't stay with the season but instead zips and zaps all over the place (case in point: the 30 degree difference in weather between this weekend and today. Ick). *Those who park their huge boat SUVs (I can make fun of them now -- hahaha) over the line and then give ME a dirty look when I park next to them. *Pointless homework assignments. My son is taking beginning Spanish this summer, and we just spent half an hour drawing and labeling a map of South America, showing all the countries where Spanish is spoken. I'm sorry, but this is ridiculous. I mean, if you don't know they speak Spanish in Chile, for example, and you happened to end up there by accident and heard everyone speaking Spanish, wouldn't you just start speaking Spanish? It's not like you'd be totally unaware that a Latin American country would be Spanish-speaking, and be so caught off-guard that you wouldn't be able to respond with your hard-earned first-year Spanish. Geez. KnitPicks is having a sale. I went to the sale site and there was NOTHING I wanted to buy! Did you do it? Show me your list! I liked it so much I may do it again. No one got the EXACT make/model/color... so we have several winners. 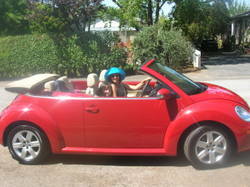 MELISSA was the first to figure out that I got a VW Beetle. HOLLIS guessed red (and several other colors) so I am giving her and WENDY a spot in the winners' circle (since Wendy was the first to make a stab and go unequivocably with red). And MARIA was the first to guess a convertible! I guess the Germans don't advertise the same way "over there" as they do "over here!" Thanks, Ramona... and I'll give you that Spritztour (joyride) the next time I see ya! How high can I jump??? I can barely type, I am so excited. My hubby just bought me a new car. YOU have to guess what kind and color of car I got. HINT... go back to this post. There's a little hint hidden hint their somewhere. The amazing thing is I had NO IDEA I was going to get a new car, let alone the kind of car I was going to get, when I wrote that post. And tell me what color you think I got. I'll announce the winner on Tuesday when I actually get to drive home with the car (it wasn't quite ready).